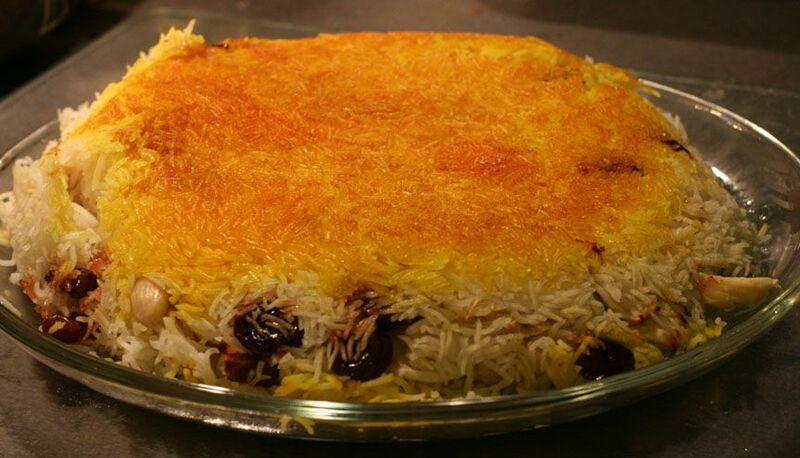 Tahdig is a Persian rice dish, cooked in two stages, that has a very crispy bottom. The word tahdig itself is Persian for "bottom of the pot." The crusted rice that is found at the bottom of the pan, after the rice cooks, is the hallmark of the dish as well as the most coveted part. It can be served alone, as is, or as a side dish with stews and other main dishes. Although it is an extremely simple dish with very few ingredients, some additions are common. Adding a pinch of turmeric or dissolving some saffron threads in water and adding them to the rice gives the dish a boost of flavor as well as bright color. You can also make an herbed version by including finely chopped cilantro, or parsley if you prefer it, to the rice. Some tahdig cooks also swear by adding a couple of tablespoons of plain yogurt to the cooked rice to make it creamier in the center. Tahdig is always a rice dish but the crispy bottom is sometimes achieved by frying very thinly sliced potatoes to form the crust. Another option is using pieces of lavash bread. Although lavash, a very thin, soft, unleavened flat bread, is usually considered Armenian, it has Persian roots and is eaten all throughout the Middle Eastern regions today. It's often used to scoop up stews or other main dishes, in place of a fork. This recipe uses a rice steamer to cook the rice. Simply follow the manufacturer's instructions on how to cook the rice through for your particular steamer. And note that some vary in the amount of water or rice to use. You can certainly cook rice on the stovetop, however. A steamer simply gives a nicer separation between the grains but stove top cooked rice will work just fine. Combine the rice and water in a saucepan and bring to a boil. Reduce the heat to medium-low, add salt and stir. Cover the pot and allow to simmer for 20 minutes or until rice is tender. In a large skillet or saute pan, heat the olive oil on medium heat. Be sure to coat the sides and the bottom of the pan. Add the cooked rice and "mash" it with a spoon to compact it, ensuring it is evenly spread throughout the pan. Cover and cook for about 15-20 minutes on medium heat or until you hear it crack and sizzle. Once the rice is done, remove the lid and carefully flip the rice over onto a serving dish, so the crusted rice is now on the top. The rice should have a thick layer of brown, crispy rice. Serve immediately.